108 opened around the corner from the old Noma on July 27, 2016. 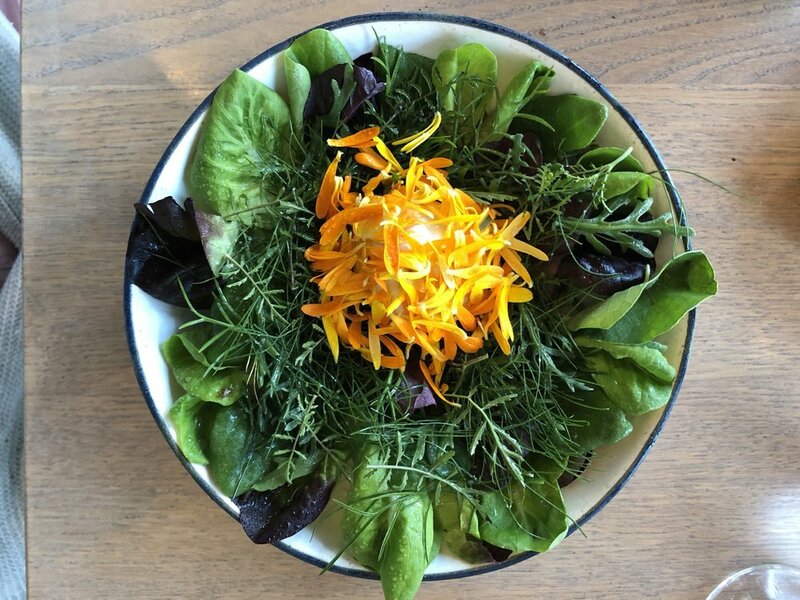 Co-owned by Noma's Rene Redzepi and with Redzepi's trained head chef Kristian Baumann at the helm, 108 quickly rose to stardom as a way to get a less expensive piece of the Noma experience. 108 received its first Michelin Star shortly after opening and this summer was named #98 on the World's 100 Best Restaurants. We first came to 108 in the summer of 2017 because we wanted the Noma-lite experience. We love everything Noma, to the point where we probably should wear "I <3 Noma" t-shirts on the regular, so we couldn't have been more excited to land a reservation at 108. 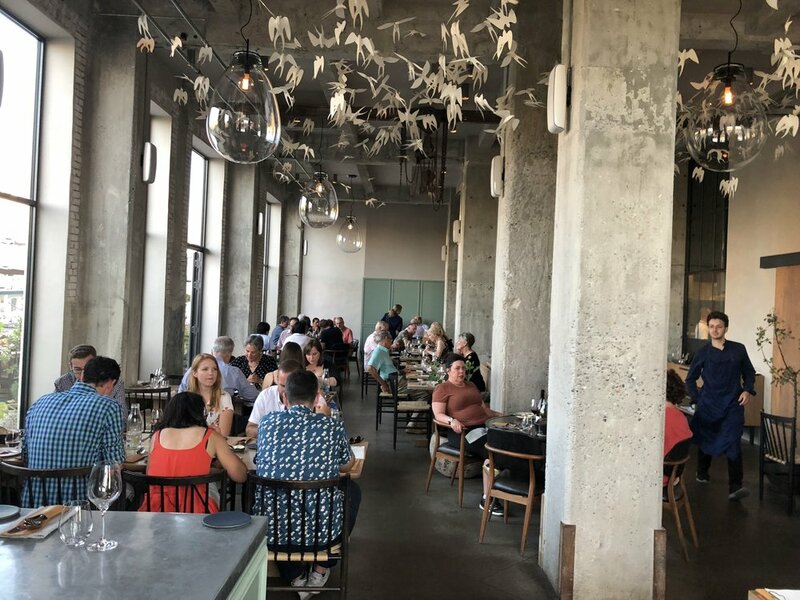 We had been the previous night to Noma Under the Bridge, which we L-O-V-E-ed, and we sat right next to a couple who flat out said 108 was better, so our expectations were sky high. Our experience the first time was a disappointment. The food was a mix of fine and inedible, with one dish being served literally with a cup full of raw flowers which was probably one of the worst things I've ever eaten. There were a few good dishes mixed in, but overall we were disappointed. As our waiter at Amass put it, "The dishes look good for Instagram, but that's about it." 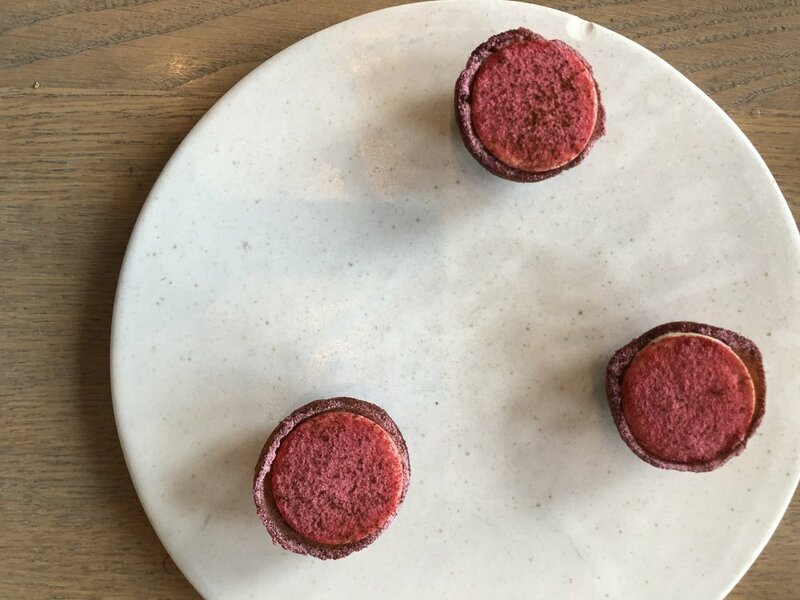 We decided to give 108 another shot on our recent trip to Copenhagen, especially after we visited the new Noma, and we're so glad we did. The menu had been updated and all of the dishes were not only beautiful, but they tasted great as well. 108, you gave us a bad first impression, but here's to second chances. 108 has an a la carte and a tasting menu, we elected both times to go a la carte, mainly because we had done so many tasting menus on both trips that we were tasted out. We're only going to focus on the items we tried this time, as the old ones were not that good. Every place in Copenhagen has great sourdough bread. Every.single.one. 108 was no exception, and we could have eaten only this bread and walked out happy. The summeriest of summer salads. All of the ingredients were picks from 108's farm that day. The middle contained an almond oil sorbet, which was mind-bowing. A huge upgrade from the crap flower bucket we had the previous year. One constant at 108 is the stunning presentation. The dishes are gorgeous, every one of them. The flowers around the edge of this dish change not only daily, but minute to minute, with different tables getting different colored flowers. I'm a self-proclaimed lamb-oholic, so I loved this dish. The raw lamb and pickles made for a savory, gamey, and sour flavor that was delicious. This was a carryover from the previous year that was still on the menu, and the only dish we actually enjoyed the year before. The mushrooms were fried lightly and perfectly. Mixed with the yolk sauce, it felt like you were eating a fried steak. This was the one semi-miss of the night. The quail was good, and the sauce was good, but the dish didn't have a lot of flavor, and there wasn't enough meat on the bone to satisfy. These babies were good. I could have eaten 100 of them, but three was probably a good choice so that I didn't gain 100 pounds. The icy seaweed ice cream offset the hot doughnut beautifully. Another holdover from last year's menu. This was a play on the traditional Danish berries and cream dish, similar to the one we had at Noma. Sweet and refreshing. When we walked in, there was a glass of champagne waiting for us, welcoming us back to the restaurant. That's a nice touch that most restaurants don't do, and we really enjoyed that. 108 has a variety of wines, but we're lame drinkers, so we just got non-alcoholic juices. My favorites were a raspberry soda and a mandarin orange soda. 108 is a beautiful space located steps away from the harbor. It's airy and light, and everything is set up to create the perfect Instagram shot. The kitchen is open in the back, and everything screams Millennial Eye Candy. Needless to say, we loved the vibe. The first time around, we thought the service was just okay, but this time the service was excellent. We asked our server what someone was eating to our left, and she went on a 10 minute excursion to figure out exactly what it was. The chefs came out to explain the dishes, a thread carried over from the Noma mothership. Always give something a second try, because everyone is entitled to an off night; What's up with all of these places being named after numbers? I thought restaurants were a safe place where we didn't have to do math; I wish every restaurant was next to a harbor that was clean enough to swim in; Flowers are good to give to ladies, but use modestly in fine-dining dishes; If everyone could eat sourdough every day, I think the world would be free of crime and skinny people.